After listening briefly to some of the State of the Union address, I found myself wanting to do a little check up on where we are in the market cycles. Trump told us that this is just the beginning of the good times for stocks, jobs, and the US economy. Well… asset class, sector leadership and the credit markets have a different “spin” if you’re willing to look at reality. Here’s where we are and what you can expect next from stocks, bonds, and commodities (inflation sensitives). 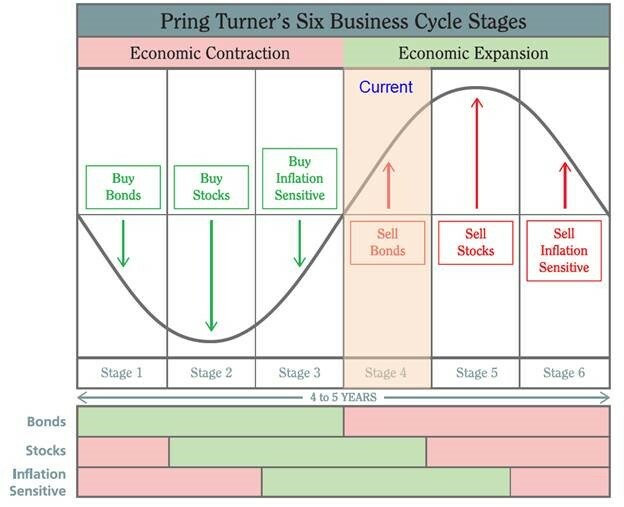 There is almost no doubt, that we are now in Stage IV of the Business Cycle, as defined by the great cycle guru, Martin Pring. Take a quick look at the chart below. If I had to pinpoint our current position, it would be on the right-hand side of the column marked “Current”. What evidence do we have to support that position? Well, first we can do a simple return comparison among the three major investment food groups- Stocks, Bonds, and Commodities. The most notable moment in recent history when we can point to a day when asset class performance turned, was February 11th of 2016, almost exactly two years ago. As a side note, the week of February 10th happens to be a cycle turning point that goes way back in time marking either tops or bottoms in stocks. I have no idea why that date has this effect but the data is pretty solid. You might glance at the calendar (wink). On February 11th of 2016, we witnessed something important. Bonds put in an interim high in price and in the very same week, stocks and commodities put in a final low after a very long and painful period of high volatility and price declines through most of 2015. But the cycle continued to evolve! On July 7th, 2016 there was another shift of sorts in which bonds put in a final peak and really started to sell off, locking in a longer-term period of rising interest rates in sync with the Federal Reserve raising the Federal Funds rate. Finally, on June 22nd, commodities and inflation hedges really began to get traction and are now OUTPERFORMING stocks for the first time in a long, long time. Let’s add a little data and color coding to support this discussion. The performance numbers below are shown from the various dates described above through yesterday. One could give credit to Trump and his election for the sudden change in the market conditions favoring stocks and commodities over bonds. The timing of his election and subsequent asset class performance differences is just too exact for it not to have been the catalyst. It’s pretty safe to say that somewhere in late 2016, the business cycle shifted strongly into Stage IV. So the good news is that we still have Stage V and Stage VI of the cycle left before we might expect to recognize and register an actual economic recession. The bad news for investors is that Stage V and Stage VI are very painful for most as stocks enter bear markets and the investors experience the worst period of wealth destruction (those without a risk management system). Commodities can be a safe haven but most investors don’t own commodities in any volume. Bonds eventually find a low in late Stage VI as investor look for safety and then the cycle starts over at Stage I. One of my favorite tools to look at the yield curve is this interactive, animated time lapse function on Stock Charts.com called the dynamic yield curve. 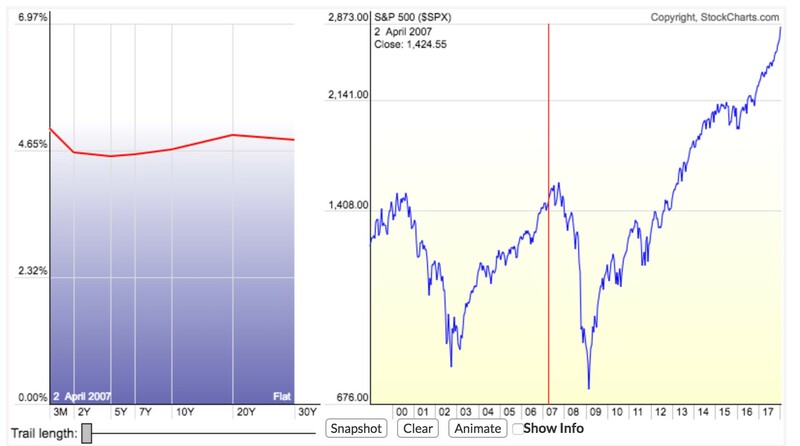 Put your cursor just to the left of the market peaks in 2000 and again in 2007 and watch what happens to the yield curve (a line showing US interest rates across various maturities from 3 months to 30 years). What you’ll notice if you do it right is that when the 2-year note rate exceeds the 10-year note rate (inverted), we typically see a top in stocks within a quarter or two. If you bring the bar forward to recent history, you’ll see that we’re not there yet. But at the current rate of change in the different maturities and the Fed on tap to raise rates in both March and June, it would seem likely that we might see an inversion in the summertime or the early Fall. Remember, the business cycle says to expect stocks to top NEXT and the economy should head toward contraction so this is all very consistent with what the markets are telling us, loud and clear. Practically that means we should be on the watch for a meaningful market top followed by a recession. This is not the message I heard in the State of the Union. This week, we finally saw a little crack in the parabolic price appreciation seen in the global stock markets. Volatility is on the rise, but the first signs of selling pressure rarely mark the final peak. It simply says to all that the easy money is behind us and we need to be tolerant of more frequent and larger down days. Even the most notable market crashes and disasters in history did not manifest from thin air. There are often months and months of deterioration in a number of variables and market internal indicators before real and lasting price damage begins. This is not the top. But this is the beginning of a period of higher volatility. With that said, the markets are way off of any sort of trending averages which we might use as typical sell triggers. We have taken some profits across the board in our portfolios, raising cash to nearly 20%. Our Reasoning is that prices will likely retrace back to the longer-term price trend from here. Those levels are solidly 5-7% below the recent highs, which would mean erasing all of the gains YTD, just to get back to an intermediate-term trend and moving averages. We’d like to keep some of our recent gains and have found through experience that a healthy return early in the year is something to protect. No doubt, we’ll look to make some new buys and add back market exposure in the near future but we want to let things move off of the extremely overbought condition first. That’s if for now, stay tuned.